1. Profits in excess of what the market would otherwise command. A company can receive economic rents if it is a monopoly, or if it is part of a cartel. See also: Rent-seeking behavior. 2. The amount of money the owner of a property can reasonably demand in order to rent that property. Fig. 54 Economic rent . a money payment made for a FACTOR OF PRODUCTION that is over and above the minimum payment to keep it in its present use. This minimum payment is known as TRANSFER EARNINGS and it represents an OPPORTUNITY COST. Thus, for example, a person might just be willing to work as a lecturer for a minimum of £1,000 per month because he could earn this amount working in his ‘next best’ job as a taxi driver. If his actual earnings are £1,100 per month, then his monthly earnings would comprise transfer earnings of £1,000 and economic rent of £100. Economic rent is a surplus insofar as its payment is not necessary to ensure a supply of a particular factor of production. Fig. 54 shows the demand for, and supply of, lecturers at the prevailing market wage rate (OW), which is equal to, say, £1,100 per month, enough to induce sufficient lecturers (OQ) to offer themselves to work and meet the demand for their services (D). At this wage rate, the last (marginal) people offering their services as lecturers will only do so for £1,100 per month, since this is the amount they could currently earn elsewhere as, say, driving instructors. However, since all lecturers of a common grade would be paid the same per month, an intra-marginal lecturer (Q1,) would be paid wage rate OW even though he would have been prepared to work as a lecturer for a smaller wage (OW1). The economic rent of the intra-marginal lecturer is equal to WW1. Total transfer earnings in the figure are equal to the diagonally shaded area below the supply curve, and economic rent is equal to the vertically shaded area above the supply curve. The economic rent earned by a factor of production depends essentially upon the demand for the products made with that factor and thus the DERIVED DEMAND for that factor. Thus, for example, if the demand for lecturers was to rise from D to D1 in Fig. 54, then in order to induce more people to enter lecturing and thus increase the supply of lecturers to OQ2, wage rates would need to rise to OW2. This would mean that existing lecturers such as Q1 would now earn a higher wage rate and secure a larger economic rent (W1W2). By contrast, if the demand for lecturers falls, then so will their wage rates, with some lecturers transferring to better-paid employments whilst those remaining earn wages much closer to their transfer earnings. 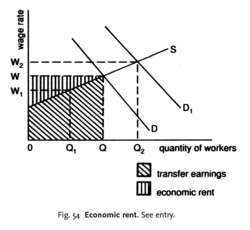 The effect of demand upon transfer earnings and economic rent will depend upon the PRICE-ELASTICITY OF SUPPLY of a factor of production. If the supply curve for a factor is comparatively price-elastic, then most of the factor earnings would take the form of transfer earnings and little economic rent would accrue - for example, the market for unskilled labourers. In the extreme case of a horizontal supply curve for a factor of production that is in perfectly price-elastic supply, then all the earnings would be transfer earnings and no economic rent would accrue. By contrast, if the supply curve for a factor is comparatively price-inelastic, then most of the factor earnings would take the form of economic rent - for example, the market for sports champions and pop music entertainers. In the extreme case of a vertical supply curve for a factor of production that is in perfectly price-inelastic supply, then all the earnings would be economic rent. Some factors of production may be in relatively price-inelastic supply in the short run but more elastic-supply in the long run, and thus may earn ‘temporary’ economic rents until supply is able to adjust fully to demand. The economic rents accruing to such factors of production are termed quasi-rents’, and they tend to disappear in the long run as supply catches up with demand. For example, in the case of particular types of work where a lengthy training period is required, a sudden increase in the demand for such work would enable persons already possessing the appropriate skills to secure large quasi-rents through high wage rates. The rent reasonably to be anticipated in the marketplace as opposed to the actual rent.For an investor familiar with economic rents in an area,there are usually many opportunities to buy properties at values based on contract rents,and then raise the rents and realize immediate growth in equity and the ability to refinance for amounts in excess of the original purchase price. Also called market rent. Firms may agree to those arbitrary constraints, especially if those constraints help generate scarcity rents. Moreover, as shown by Fullerton and Metcalf (2001), the quantity restrictions may be more expensive than other CAC policies that can improve the environment without generating scarcity rents. Fullerton and Metcalf (2001) point out that efficiency can be increased without necessarily raising revenue, so long as the policy can avoid the creation of privately retained scarcity rents. But if, through dividends, 100 percent of sky scarcity rent is returned to citizens, who then spend and/or save it as they wish, there would be little if any economic drag. They're not bashful about asserting their claim to the new millenium's atmospheric scarcity rent, even though there's no legal, moral, economic, or environmental reason for giving it to them. The Time Path of Scarcity Rent in the Theory of Exhaustible Resources', Economic Journal, 102, 813-30. Metcalf "Environmental Controls, Scarcity Rents, and PreExisting Distortions," NBER Working Paper No. Public broadcasters no longer enjoy scarcity rents that otherwise may help finance their focus on Canadian programming* Moreover, in a world with considerable viewer choice, public broadcasters, along with others, will struggle to attract viewership. To the extent that Canadian ownership rules create additional costs, they will be more difficult to absorb than where there are greater scarcity rents. In this third stage, in which the last mile of Internet connections is wired and hence controlled by only one or two providers (cable and/or telephone companies), there may well be scarcity rents associated with distribution that would allow IPTV providers to pay into a production fund. If the producer is a monopolist, the distortion persists with complete government appropriation of the scarcity rents from the environmental policy.